Is McGregor good enough to land a big punch on Mayweather? Floyd Mayweather Jr., left, and Conor McGregor pose during weight-ins Friday, Aug. 25, 2017, in Las Vegas for their boxing bout scheduled for Saturday. Conor McGregor has been kept pretty much under wraps ever since his fight with Floyd Mayweather Jr. was announced, emerging occasionally to trash Mayweather only to disappear again behind the closed doors of the UFC training center. It's a fight that really makes no sense other than millions of people want to watch it. But the economics of the fight wouldn't make any sense, either, if people saw McGregor — the UFC star who has never boxed professionally — in action and decided he just wasn't good enough to be in the ring with a fighter like Mayweather. 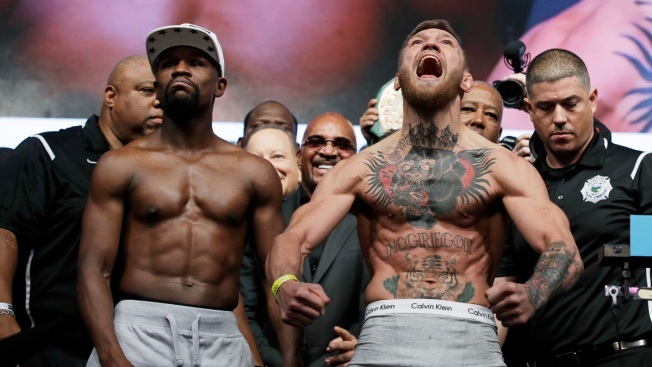 McGregor weighed in at 153 pounds Friday to 149 ½ for Mayweather. A crowd that nearly filled the T-Mobile arena — many waving Irish flags — cheered loudly for McGregor while booing Mayweather. What should be a 100-1 fight began as 11-1 in Mayweather's favor. Now it's 5-1, though a lot of big money — including a few million dollar bets — has been wagered on Mayweather in recent days.